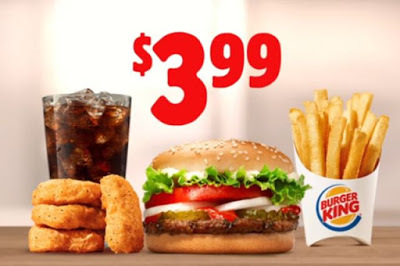 For a limited time only at participating stores nationwide, Burger King are offerin the $3.99 Whopper Jr Meal Deal! The Whopper Jr. Sandwich features a flame-grilled 100% beef patty topped with freshly sliced tomatoes and onions, lettuce, mayonnaise, ketchup and pickles on a soft sesame seed bun. The nuggets are made with white meat chicken, tender and juicy on the inside and golden and crispy on the outside. To take advantage of this deal and to locate your closest Burger King store in the US, click here. Let us know in the comments if you’ve tried out this deal! Through 4 for 4 is good deal. Tasty food and the portion sizes are good. Your Web site however, requires some work, many icons or links lead to a dead end.